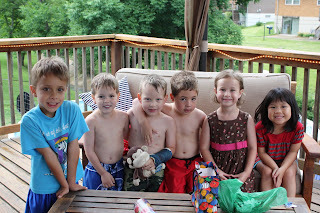 About a month ago, Meiners and I agreed to celebrate his 5th birthday with a BIG friend birthday party. As it goes, the twins have always sort of ended up with big birthday parties with their friends. In my defense, the first big party, when they were two, was really to celebrate living through two of the most difficult years of our lives. And then at three, four, five, and, well, OK, also 6, the kids were treated to trips to the Magic House, Bounce U, and other fun venues. I mean, there were two of them celebrating at the same time, so of course it would get huge. Right? Right? When along came Meiners, I guess I was tired. And maybe life wasn't quite so traumatic as to bring about such intense celebrations as it did before. Soon enough came Fussy Baby, too, so - there you go. Middle Child Syndrome rears its head without Mom intentionally creating it. It just sort of happens when you have this many kids, right? (*enter laughter from those mommies who have 5, 6, 7, etc. children ... *). So, we agreed, this should be the year. After-all, it's his 5th. And I justified a humongous 5 year-old party for the twins cuz, you know - 5 is a big age. Five you never forget. (don't ask the twins where they went for their 5th birthday...we'll just keep their poor ability to remember that expensive shindig our little secret now, shall we?) But Meiners needed The Big 5, too. We invited all his classmates. We invited his best buddy Sam. As the day approached, I began praying fervently for good weather. I made a note on the invitation that there would be a raindate. And as the day of the party approached and I really didn't want to buy two sets of balloons for two different Sunday afternoons, (or clean the house twice, or set up the slip -n- slide twice) [see, I told you I was horrible], I began to regret the rain date idea. And as the clouds started rolling in today, and I began to realize neither Meiners nor I had any idea what the children's last names were or what their phone numbers were to call and ensure the party would go on - inside if necessary - I truly began to realize, I need to be more organized. And maybe it's a good time to let go and let God. Cuz our big pool has a big leak. That we just discovered today. And this morning our sewer backed up. For the first time ever in our 11 years of living here. And clouds were rolling through indicating the party may truly have to go on - inside. And when I arrived at Dierberg's to pick up the balloons, I discovered they'd lost my order. And time was literally running out. Breathe, Karin. I began to count my blessings. At least the pool was still standing. At least it was just a small sewer back-up. I've certainly heard horror stories in our older subdivision. And at least, when you're 5 and your backyard birthday party has to head indoors, you really don't care - because you're really just excited that your friends are coming over to play. The rest? The rest just doesn't matter. Because you're 5. And it only happens once. And I think it turned out just fine. Now, Sashi turns two on Wednesday.